Getting out of your own head and having someone else push you—no matter your fitness level—helps achieve fitness goals you may have thought out of reach. The fact is instructors push you harder. A study in Medicine & Science in Sports & Exercise showed that men who were supervised by an instructor during resistance training showed significantly greater strength gains than unsupervised men after only 3 weeks. So while it might initially sound intimidating, this kind of hands-on supervision from a skilled instructor is just the thing some of us need to jump-start a physical transformation. 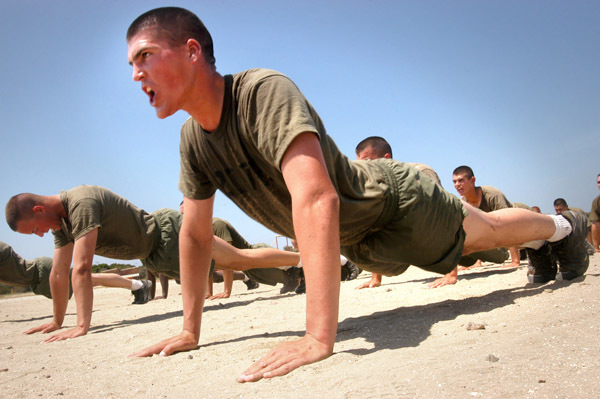 Boot camps can resurrect the much-needed synergy sometimes lost in the working world. There’s a lot less real-life socializing going on now than in the past, which is why signing up for a boot camp is might be a great way to kickstart your social life. Not only is it a place to meet-up with active people and get a killer workout, but it’s also a way to include some much needed human touch and interaction in your life. And here’s why that’s important: A Dartmouth College study showed that open-heart-surgery patients with no social support system were four times more likely to die in 6 months than their supported counterparts. In another study, researchers at the University of California, San Francisco, who studied NBA teams found that the more a team touched (fist bumps, high fives, team huddles, etc.) the better they played. There’s something about the mix of blaring jams, people on the move and an instructor that balances out into a healthy mix of strength and cardio. These mini-adrenaline boosts are sometimes just the thing you need to allow you to step outside of your comfort zone in ways you simply cannot on your own.